Try Sapling Intro Stats at no cost to students through Spring 2018! Sapling Intro Stats is an online, user-friendly instructional homework system created and supported by educators. Each question includes detailed, wrong answer feedback that targets students' misconceptions, as well as fully-worked out solutions to reinforce concepts. In short, it is homework that teaches. Error-specific feedback: Every question becomes a teaching opportunity, addressing (correcting) students’ misconceptions. Full, detailed solutions with every question: Every question includes fully worked out solutions to reinforce concepts. Personalized Instructor Support: We match educators with a Sapling Learning Client Success Specialist—a Ph.D. or master’s-level subject expert—who provides collaboration, software expertise, and consulting to tailor each course to fit your instructional goals. 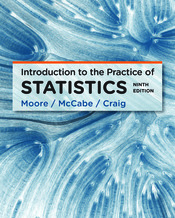 - Step-by-step questions: guide students through the steps of conducting statistical procedures. - Skill-builder questions: build skills in computing descriptive and test statistics. - Conclusion or interpretation questions: develop students’ ability to interpret and make conclusions. - Visualizations: bring statistics to life and allow students to interpret and manipulate various distributions. - Video Technology Manuals (VTM): These popular videos guide students through their statistical software use. Available for Excel, SPSS, TI-83/84 calculators, JMP, Minitab, CrunchIt!, R Cmdr, and R. - Math Review: This special content area provides practice with algebraic concepts and skills. Complimentary Statistical Software: - CrunchIT!, Macmillan’s Web-based statistical program with a familiar Excel®-like interface helps users carry out the statistical operations and graphing needed for an introductory statistics course and saves time when working with data.